Thanks to our continuing sponsor, Triad Semiconductor! They make a lot of what we’re doing possible! Check out ViaDesigner.com/TheAmpHour to get a free year subscription! We have a t-shirt, which you can now buy! Get in on the low cost initial purchase, buy before April 29th! We hired a couple freelancers off of People Per Hour to do our artwork (and previously our transcriptions). Quality often correlates with price! We decided not to go with 99 Designs, though that’s another good option. T-shirts should arive in time for both Hamvention and Maker Faire. Please wear them! Find other listeners! The Dayton Hamvention (sponsored by DARA) will be a huge set of events and a swap meet that will make the Wyong field day that Dave attended look like a garage sale! Chris will try to check out the museum at Edwards Wright-Patterson Air Force Base. Chris will be on the lookout for mullets in Dayton. They and rat tails characterize wonky hairstyles from the 80s. It was started by Bre Pettis (of MakerBot) and Brady Forrest in Seattle in 2006. Seth Godin has a good post on how to do concise, impactful presentations. Do crowdfunded tech projects sometimes bamboozle people? The EEVblog forum is skeptical of the Mu Optics hosted on IndieGoGo. Chris reminds everyone that EEstor still hasn’t delivered (and likely never will). Bamboozling is one of the major drawbacks of the yet-to-be-implemented JOBS act in the US, which allows small investment by individual investors. The ZionEyez project is another failure, with definite overtones of shadiness. Projects that are simply late (yet still promise to deliver) have some pundits claiming that Silicon Valley’s hardware renaissance is stalling. Bunnie has been finding some interesting stuff in the China marketplace, this time a $12 cell phone. Chris worries that super low cost hardware will affect all of us from an employment perspective, but Dave assures him that very little employment comes from the consumer space. What about you? Do you work in consumer electronics? If not, which field do you work in? Check out our survey at the bottom of this post. The new Beaglebone Black looks great! It’s now $45 to get closer to the price of the Raspberry Pi and has many many more I/O. Chris is lukewarm on the Cloud9 IDE and Bonescript. Light pens were how people used to interact with screens and persisted where Chris used to work in the fab. Bill and Mara got married in the geekiest way: They soldered as part of their vows! Awesome! Survey! What kind of industry do you work in? Please consider supporting the show by buying one of our t-shirts! More colors/designs will be available soon. Mu camera: HaHa, called it on hackaday in _third_ comment 😛 The closest Chinese sensor with same resolution is >$500. I also called Ouya and it looks like its gonna deliver :/ But at least half a year too late to be relevant. Chinese are already shipping $45 Android TV dongles with better specs based on RK3188 (4 core A9 + faster GPU). Mobile is moving so fast Tegra 3 will be too slow for any gaming in a year. poll: as IBM discovered a long time ago safest bet is going into Support 🙂 One off custom designs/solutions pay the best. I think Dave is right, but not in the way you mean. 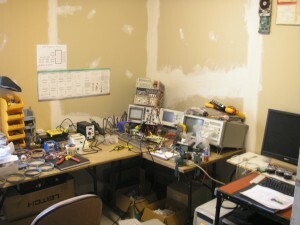 Cheap high performance gear from China is bad for ham radio. Great for communicating by RF, but bad for the ham traditions of using something you developed or adapted yourself, and in the process learned something. Dont know about that. Plenty of people hack those Chinese radios to bits. You have schematics flying around, chip datasheets, source code for alternative firmwares, hardware mods fixing shoddy Chinese “engineering” (usually cost cutting attempts that end up removing vital parts like caps from harmonic filters hehe). They are great to quickly and cheaply ‘get your boots on the ground’. Yup, rasz has it right. I’m not going to just go build a radio first. I need to get comfortable first. That’s like handing someone a box of parts as a beginner and telling them to make an MCU dev board or handing them an Arduino and telling them to go figure out WHY they should want to go build their own (once they have realized the power of having electronics on hand). Well, except for a few minor details. This is the route many take after getting their ticket, me included. 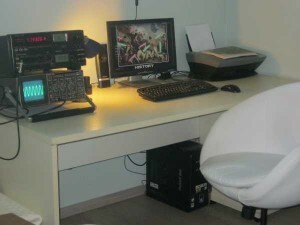 However, 2m/70cm FM is a chat room for the most part and only supports a few limited digital modes. If you are into ARES or SkyWarn or events coordination for example, this is all good. It’s no coincidence though that teens, such as Scouting troops, are first shown the HF bands – as the thrill of making intercontinental QSOs is powerful marketing juice. Plus, HF offers all the Digital modes and much more. Don’t get me wrong, I like 2m weak signal and want to explore EME, but HF is where it’s at. Building a kit is a rewarding experience. It will give you an excuse to solder, challenge yourself in terms of how well and how fast you can do the kit (100+ component kits that is) and will leave you with a very functional piece of equipment, albeit QRP. If you learn Morse code, or build a SSB rig to use for say PSK-31, you will get a lot of fun hours out of that 5W transceiver. Antennas are a non-issue because you have the attic at a minimum if your neighbors (or Wife) frown on anything in the backyard, or you just don’t have a backyard for a 40m dipole. At the same time, purchasing and fixing-up an old Icom/Yaesu as Dave suggested is another part of what Ham radio is all about. Chris, we are buying you a rig at Hamvention! A General Class with no rig is like a EE working in the clothing business. Cue Sam Kinison screaming clip…. I wonder how they will do with the Mu Camera “without the complicated optics” which is often just a single Germanium lens (still not too cheap). Hilarious how he is talking about ditching the most expensive parts: In fact this would apply to termal imaging sensor and the optics. After removing that a TIC is rather an expensive low volume low resolution camera thats mainly more expensive than a consumer camera because of the low volume (often FPGA based). Hes talking about hiring another SW guy? I bet they are tinkering with the phone sw and don’t have a clue of the HW challenge they’re up to. And the legal challenge: This thing must be fixed to 9Hz or lower frame rate, otherwise selling to civilians will get nasty, even to their listed countries. 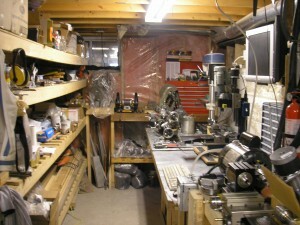 Dave & Chris, I was really surprised when I was mentioned on this weeks show during “Workbench of the Week”. Just to be clear I have a Hitachi V-152B 15MHz analog oscilliscope not a Tektronics. 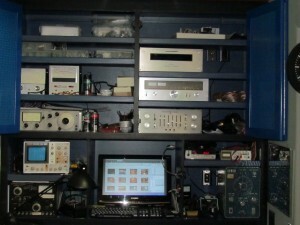 The other equipment in the picture includes a HP 333A Distortion Analyzer, Sound Technology ST1000A FM Alignment Generator, Cenco Audio Oscillator (1965 with vacuum tubes) Fluke 8050A DMM and Fluke 1900A Frequency Counter. 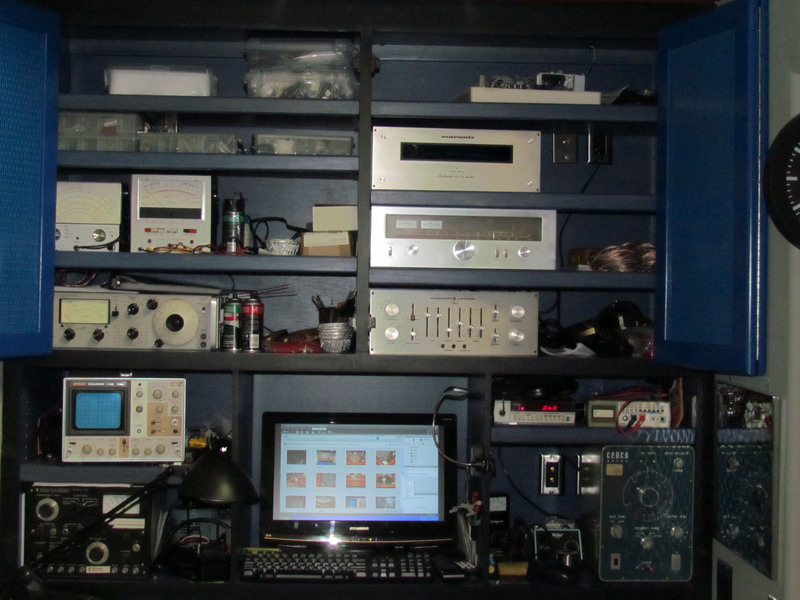 Since the picture was take I’ve added a HP 8640B Signal Generator and a Leader LAG125 Audio Generator. We agree that’s not the right thing. The stereotype Dave was referring to was that we were taking advantage of less fortunate people, not that everyone in India lives in slums. While you’re in Dayton, make sure to go downtown to Mendelsons, and go to the third floor. It’s a massive surplus store of electronic equipment and parts. Also, the first floor has everything you’d ever want to setup a chemistry lab too. Great tip! Thanks! Are you going to be there? Light pens are also one of the biggest tech cringes in movies – Die Hard 2, when the bad guy uses a light pen to move the horizon position so the plane crashes. What was the Japanese version of ignite? Pecha Kucha? Yeah, that’s what I considered to be a similar kind of event. It figures… I work in Dayton, but during the Hamvention, I’ll be in Australia for work. How does that happen?